One of my most popular posts was how I made my Cake Toppers inexpensively out of paper (Click HERE for that post). Today I have another Cake Topper to show you. This one is perfect for any of you looking for a First Communion Topper. I made this one for My God Daughter's cake and want to share the files I made with all of you. The nice thing about these toppers is that they can make a simple plain cake look fabulous with very little effort. Isn't it so pretty and elegant?! And, if you're looking for ideas for a boy, simply leave off the pink Cross or cut it out of blue paper. Click on the links below the post to see what supplies I used. I used glitter foil paper from Recollections and avoided a glittery mess (this one does not flake), sorry could't find a link for it. For those of you that want to watch it all come together and the how to's, here is the process video. 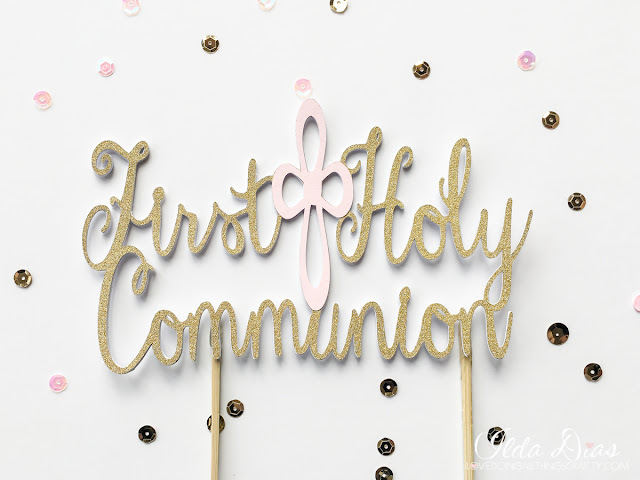 Click below for your First Holy Communion Cake Topper FREE file download! Hope this has inspired you to create your own toppers for your special occasions! I love this. I was able to download both files, but for some reason, the Holy Communion will not upload in Circuit Design. Is it possible for you to email me the SVG file? I would love to make this for my nieces First Communion.